The Salesforce.com marketing pitch at the recent Dreamforce Europe was wearying at times but it is not complete nonsense. Chief executive Marc Benioff spent the first hour of his keynote reiterating what he has said 1,000 times before about "no software". The "no software" slogan is deceptive, since Salesforce.com is a software platform. 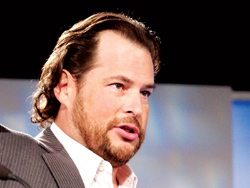 Benioff deliberately conflates multiple issues, including zero software deployment, cloud availability, and outsourced hardware maintenance. The core of the model is multi-tenancy. One entity (Salesforce.com) takes responsibility for your hardware and application server. Multiple entities (including you) get shared use of those resources, financed by a subscription. Originally this was a single CRM application. Now it is called a platform (known as Force.com) since you can build many types of application on that platform. Is this "software as a service", or just a web application? It is both, especially since Salesforce.com publishes a SOAP API and claims to be the largest users of SOAP in the world. I asked Adam Gross, vice president of developer marketing, whether the platform can also support REST. The answer is not really; you can create your own REST API to some extent, but authentication must be done through SOAP. Developers can customize Salesforce or write their own applications (which is really the same thing) either by simple configuration, or writing code in APEX, which is a language created especially by and for Salesforce. Under the covers, I understand that Salesforce runs on Java and Oracle, (an upgrade to Oracle 10g is due later this year) so your APEX code ends up as Java byte code and queries Oracle. This is hidden from the developer, though. One of the interesting features of Force.com is that you can develop entirely online. You can also write APEX code in Eclipse. There is a sandbox facility for testing. Another idea is to create mashups, which use web services to combine Salesforce applications with other web applications (just as Salesforce itself does with Google documents). The next version of the Salesforce.com platform, available shortly, includes Visualforce, a tag-based syntax for creating a custom web user interface. Visualforce uses a model-view-controller pattern. The Salesforce.com model has several attractions. It has inherent advantages. For example, hosted applications make more efficient use of hardware than on-premise servers. Another advantage is that rolling out a Salesforce.com implementation is easier than introducing something like SAP. There is no hardware aspect to worry about, and the application is usable out of the box. Some of the customers I spoke to talked about failed or arduous implementations of SAP or Siebel systems.